Last month Three UK, the network that likes to think outside the box (cough), announced a new product that aims to free users from the tyranny of fixed broadband. 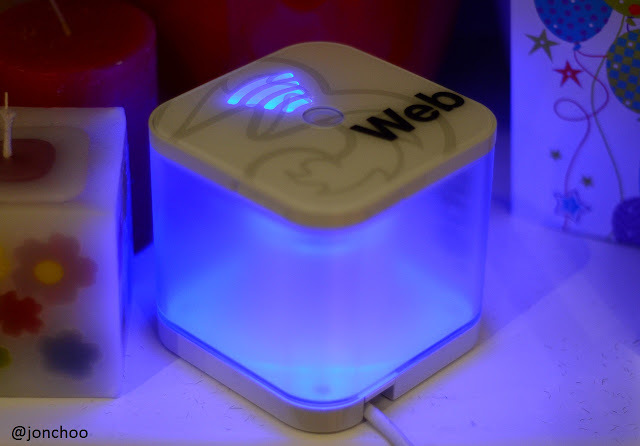 The cute boxy Web Cube is a semi-portable wireless access point hotspot optimised for home use. Like Three's own MiFi, the Web Cube supports up to five simultaneous wireless connections, HSPA+ download speed of up to 21.6 Mbit/s and HSUPA upload speed of up to 5.76 Mbit/s. Three is currently conducting trials in three locations: Glasgow, Edinburgh and Leeds. It is likely that not all Three base stations has been upgraded to take advantage of HSPA+ technology yet, like where I live just outside North London (more on this later), so do bear that in mind when reading the review. The Huawei-made Web Cube has been lovingly designed and is both stylish and practical. The case is made of translucent white plastic housing the internal hardware and a couple of blue LEDs on the top (as a signal strength indicator) and glowing inner blue LEDs that doubles as a network status indicator. I am not a fan of blue LEDs, but fortunately the LEDs here aren't too bright to be annoying. The device is heavy enough to be able to store it on a shelf without fear it would fall under the weight of the cable. The SIM card slot is easily accessible, but as the Web Cube is probably locked to Three UK, it is highly unlikely anyone would bother accessing it. Overall, the Web Cube is a stylish piece of kit and small enough for anyone to consider packing it in their luggage bag for short breaks and holidays. Signal strength is good as I was able to connect to the Web Cube despite being separated by two walls. By default the Web Cube has already been set up with a WPA2 eight character password. This can be changed by plugging the Web Cube to a PC and entering the setup or by accessing the browser interface on http://3.home. You can also turn off the blue status light if you wish. While the Web Cube supports and impressive download speed of up to 21.6 Mbit/s, in reality it would be rare for anyone to be able to hit that maximum theoretical speed. Like your home broadband, many factors, such as distance from a cell tower, or how congested the cell tower is, or even the backend support at each base station, will contribute to this loss in speed. The speed will also depends on whether Three has upgraded a particular cell tower to support HSPA+. As far as I know, Three UK has begun rolling out the upgrade last year. Where I live, the Web Cube was able to regularly hit 3-5 Mbit/s speed, which confirms which was roughly the same speed I had with the Three MiFi E586. This is about a 3rd of what I normally achieve with my home broadband, so it isn't a bad result. But if achieving the maximum speed is important to you, it is advisable to contact Three UK Support and inquire if your area has received an upgrade. I know of several people who are able to retain a reasonable speed of around 9-11 Mbit/s with Three UK. It is just my luck that I live in an area that has either not been upgraded, or is popular with Three users. When rolled out nationally, the Web Cube will be available for £15 a month on a rolling contract which gets you 10GB worth of data or £15.99 a month on a 24 month contract, which will net you 15GB of data per month. You can keep tabs on your data usage by navigating to the browser interface (http://3.home). 10GB or 15GB a month might not be enough for serious downloaders but there is a market for university students and anyone who are always on the move (renters) and is probably more than enough for most people. If you are fine with your home broadband but instead need something a bit more portable, may I suggest checking out their flexible Huawei E586 MiFi instead. 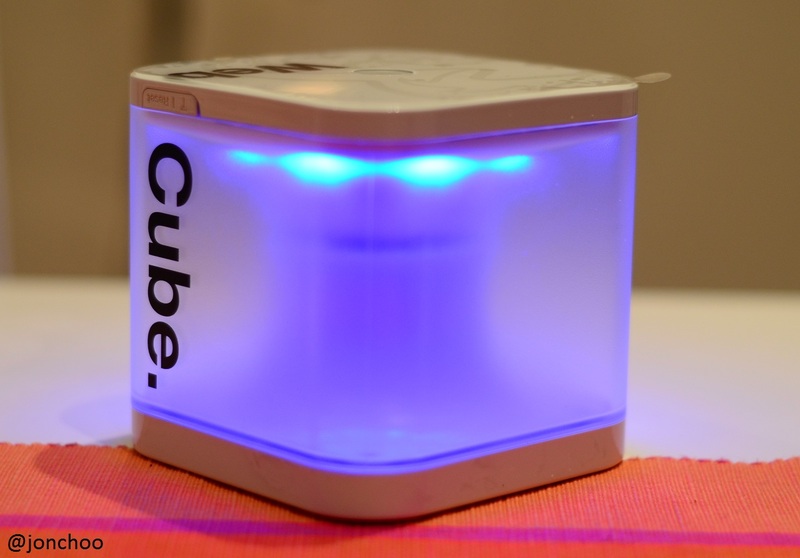 The Web Cube to be easy and fast to set up, simple to use and looks great at connecting you to the wider web. But I am struggling to find a target market for the Web Cube beyond the obvious but niche student sector and rental market, at least before the deployment of LTE technology in this country. Still I see a bright future for products like the Web Cube, especially in areas where ISP refuses to invest in, assuming of course OFCOM doesn't screw up any further. Would the Web Cube be enough to ditch your fixed broadband and the shackles of BT, or will you be waiting for 4G to arrive instead? I was reading a preview of this somewhere else the other week and thought it looked good but couldn't understand the benefit over a mifi, which functionally does the same, has HSPA+ and importantly is also portable?